Each child has the right to a happy, carefree childhood. However, more than 3.7 million children live their everyday lives in Syria amidst the adversities of war. On the 5th anniversary of the start of the Syrian civil war, the Hungarian National Committee for UNICEF tries to help by giving hope to these children – with only some pencil strokes. It was made based on the Isobar Budapest’s idea. We would like to present our initiative named “Pencil of Hope”. As the headlines in daily news continue to focus on military confrontations and the political efforts attempting to solve the conflict, we should remember that there are human lives at stake. The civil war has been keeping families in constant terror for years now, their lives being in danger every day. Shocking studies have shown that more than three quarters of young people living in Syria have lost a family member; more than 60% of them have seen a heavily wounded or shot person; and 30% has first-hand experience of some form of abuse. 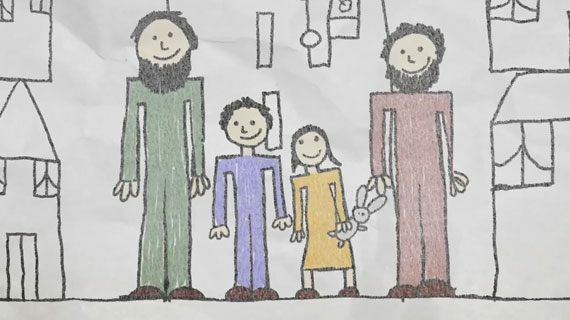 Drawings made by young Syrian children demonstrate the sad truth more authentically than any figures. The Hungarian National Committee for UNICEF would now like to raise awareness of the issue with the help of these drawings. With their initiative named “Pencil of Hope”, they ask people to redraw the sad drawings into pictures which may give some hope to the children. What is a trauma drawing? Small children, who are still at the beginning of their lives, do not possess the vocabulary to express themselves or their inner thoughts yet. That’s why most often they try to share their inner psychological struggles, their image of themselves, their opinion on their social relations and their ideas on their place in the world through drawing. It is not surprising that the drawings with the most intense visuals are created in crisis situations and under the effect of traumas. On the one hand, it is a direct response to the events occurring around the child, while on the other hand, it is their unique way to deal with the traumatic events that happened to them as their subconscious also leaves its mark on their drawings. It is a long-established practice in psychology to treat patients through drawing: each stroke, the choice of colour, as well as the use of space represent a small guide in the maze that can eventually lead to the soul of the child or adult.